Our original plans had us leaving Fernley at 2 PM, but thanks to Lisa's extensive pre-packing and my getting my work cleared by 11 AM, we left the house around 11:30 AM, although we did immediately stop for lunch at Arby's before heading east just past Noon on US-50A to Fallon and then south on US-95. The air was thick with smoke. The route south of Fallon was a road neither of us had ever traveled. Much of it is very stark, although with all that smoke, we hardly could see much of it. The two-lane road has a 70 MPH speed limit, and there wasn't a lot of traffic southbound. There was quite a bit of it northbound, much of it very likely heading toward Burning Man from the look of the vehicles and the odd piles of stuff lashed to their roofs. 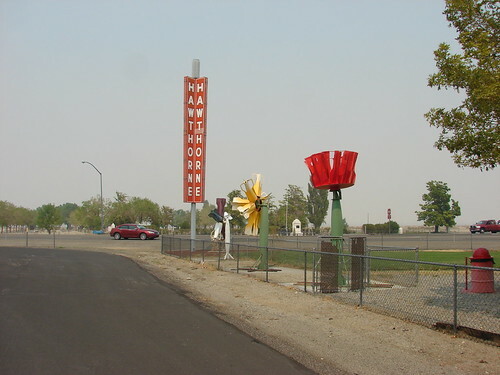 We made astonishingly good time to Hawthorne, home of the Army Ordnance Facility, and had time to stop for an hour. 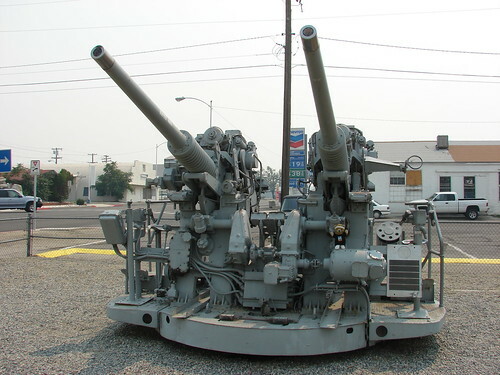 travelswithkuma sits on an AA gun in the Hawthorne city park. The park has wind sculptures made out of old bomb casings. 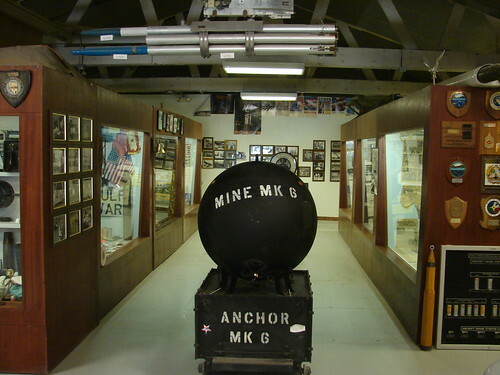 A block or two south of the park is the Hawthorne Ordnance Museum, where among other things you can see 16-inch shells and the barrels from which they were shot in their front lot. 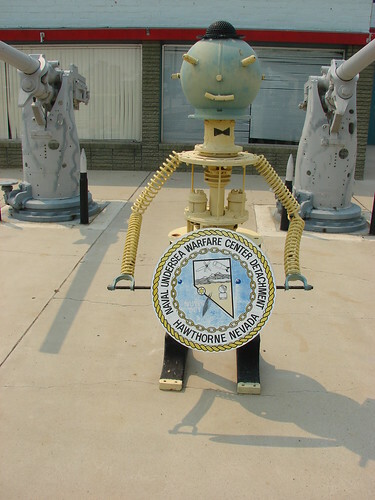 You have to love a naval facility in the middle of the Nevada desert. 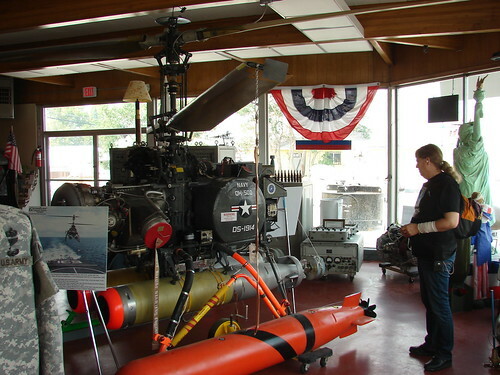 Lisa looks at a remote-controlled helicopter. That looks like a mine, all right. 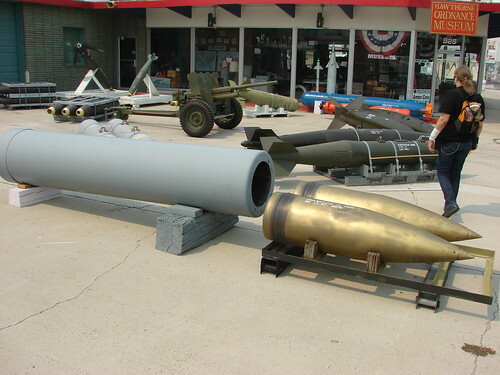 Lots more photos of bombs and other military stuff in the Hawthorne Set. We left Hawthorne still well ahead of our original schedule. But it didn't last. Cell phone service along US-95 is sort of spotty. I got a call, but as I tried to answer it, I lost the call and it went to voice mail. I couldn't retrieve the call while driving (you need the handset, and even if it was legal, it would be stupid to try and do it while heading down a 2-lane highway with no shoulder at 70 MPH). There weren't many places to pull over. 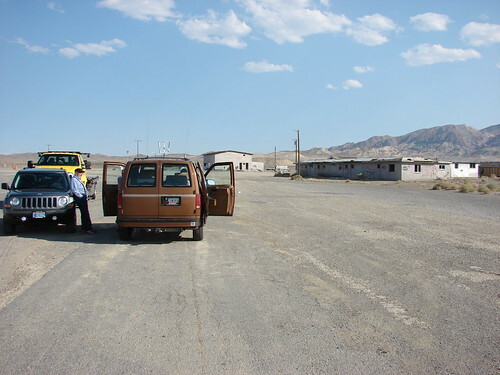 Just past the US-6/US-95 north junction at the ghost town of Coaldale, there was room to pull over near the derelict gas station/restaurant/motel complex. As I was retrieving the voice mail, another vehicle drove over. An older couple from Klamath Falls were driving to Pahrump, had not really understood how far it was, had not refueled at Fernley, and now were nearly out of gas. They didn't have enough fuel to make it the 40 miles to Tonopah, nor to limp back north to Hawthorne. We didn't have a fuel can. They didn't have AAA, although I do have it. We discussed the situation with the AAA guy. It turns out that with my AAA Plus membership, refuels like this are free. Not just no-delivery-charge, but actually free. I said, "Well, let's be good Samaritans, then," and handed the driver my AAA card. But this still wasn't a fast process. He had to call it in and get the dispatch center to approve it and make sure a different call hadn't been opened by the woman calling earlier. It took a long time: at least 45 minutes before the dispatch center called the driver back and authorized the refuel. Here you see all three of us parked at Coaldale waiting for the callback. The husband was being fairly relaxed about it other than being annoyed that he didn't refuel. Fortunately, it really wasn't a terribly hot day for summer in Nevada. Finally, after getting the approval and doing the paperwork, I signed it off and the driver got out the fuel can. The couple were effusive in their thanks and tried to pay me. I told them, "Of course not, don't worry about it; just pay it forward to someone else later," and asked the AAA driver if he needed me for anything else. He said no, so Lisa and I saddled up and hit the road again, having used up almost all of our gained time. We lost a bit more time stopping at a rest area; neither of us were going to make it as far as Tonopah. 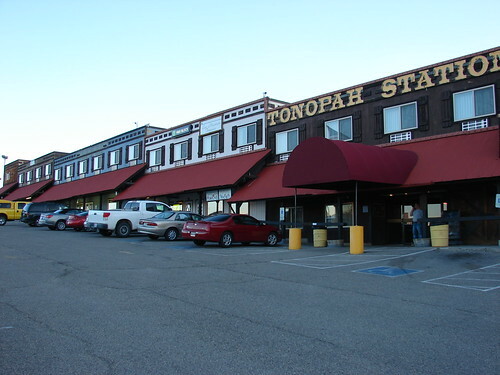 Having earned lots of Karma points for helping the folks stranded at Coaldale, we got to Tonopah just before 6 PM. 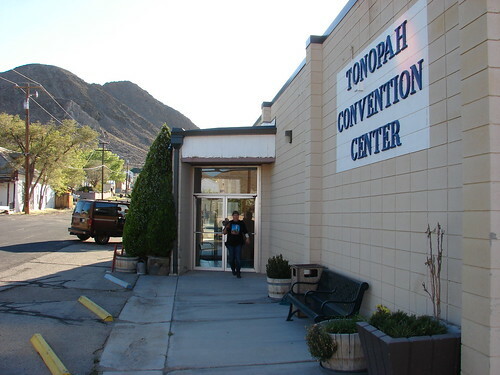 Here's the Tonopah Convention Center, which would have been where the large events at the Tonopah Westercon would have been held. Alas, because of the time lost at Coaldale, we got here after they closed for the day, so Lisa couldn't show me the inside of the center. 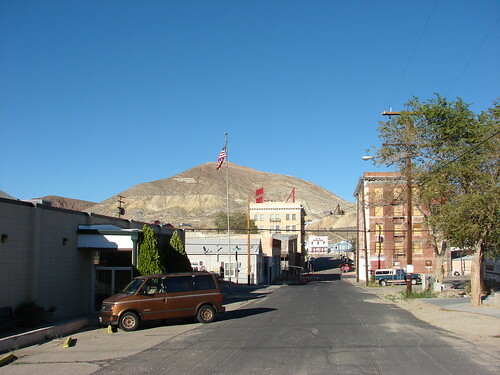 Here's what Tonopah looks like from the Convention Center. Straight ahead is the Mizpah Hotel, the restored classic hotel within walking distance of the convention center. Just after 6 PM — still 30 minutes ahead of the original schedule, but nowhere near as far ahead as our advanced departure time would have made it — we got to the Tonopah Station Hotel. This would have been the headquarters hotel for the Tonopah Westercon. They still have the "roll dice for free night" promotion. When we checked in, I gave the chuck-a-luck cage a spin: 6-6-4. So Close! After making sure the room was okay, Lisa suggested we go ahead and eat now before we moved our luggage to the room. That was fine with me as I was very hungry, so we headed to the hotel cafe. As we sat down, the woman who we had helped at Coaldale came to our table. 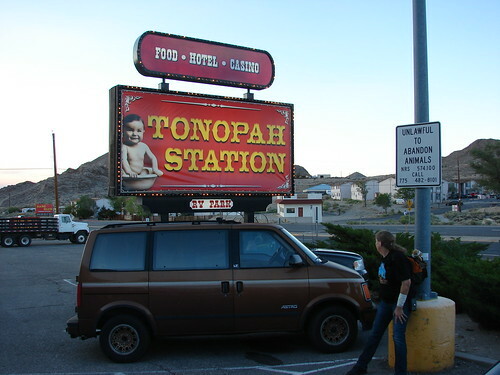 When I mentioned that Lisa and I were going to be staying at the Tonopah Station Hotel, they decided to stop there tonight as well, and they had got ahead of us when we made our stop at the rest area. They insisted on paying for our dinners, and while I initially protested, I realized that they really, really wanted to do so and I graciously accepted their offer. The prime rib dinner special was pretty good, too, with generous cuts of beef. 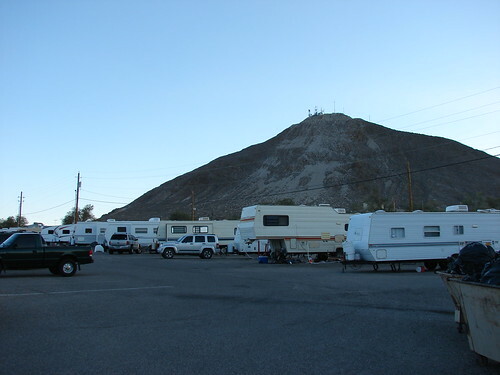 The Tonopah Station has an RV park with hookups in their back lot, which would have made for some unique opportunities for people coming to Westercon. For instance, rather than worrying about a hotel room party, you could bring an RV and hold your party there. 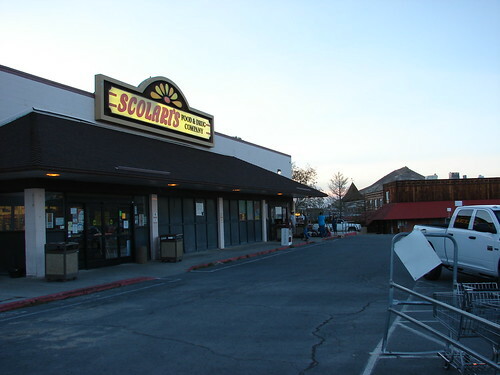 Getting supplies would not have been a problem: this Scolari's grocery store (same regional chain as Fernley's main grocery store) is adjacent to the Tonopah Station. (I mean adjacent as in the buildings are connected to each other.) Lisa and I went in and got a few things. Since the room has a refrigerator and we're carrying the electric ice chest, we could get perishables knowing we could take them on the road with us. More photos of Tonopah and the Tonopah Station Hotel in the Tonopah Tour set starting at this photo (the ones before that are from Lisa's last visit here, when the Tonopah Westercon Bid was hatched). I was impressed at how mild the temperatures were. A Westercon at this property would have been strange, but it would have been more comfortable in some ways than many of the sites at which we've held the convention. One thing that would not have been good is the stairs. The hotel is built on the side of a hill, and aside from one handicapped-accessible wing on the second floor, it requires steps to get to any sleeping room. This meant moving in to our room was a bit of a chore — as I've said before, we travel like an army on the march — but we managed. Today was a relatively short leg; the shortest of the entire trip, actually. Tomorrow we had better get moving early, because our goal is Kingman, Arizona, and that's a longer trip than we did today. However, we did pretty good today and I hope the rest of the trip goes as smoothly as today did.